I laughed out loud when, while searching for birthday plates, I came across a party plate that read “Single Again!” with a cheerful ball and chain breaking in two. I guess I laughed because it just seemed so ridiculous to be in a Jewish country and to see such ridiculously NOT Jewish plates for a “getting divorced” party. I can understand a person feeling relief or even joy about his or her exit from an awful marriage. But this plate seems to imply that marriage is a drag and single life as the ideal. YAY! I’m single again! No more ball and chain! No more being responsible to anybody but ME! Now I’m going to have some FUN!!!! 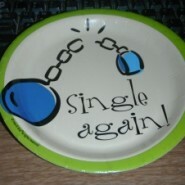 So when nobody was looking I snuck some “Single Again!” plates into my shopping cart. And for the last few days I’ve been thinking about those plates and the heavy-handed post I was going to write about this disastrous approach to marriage and singlehood vs. the healthier Jewish view. But then I remembered the former CEO, and decided to take this post in a different direction. For the past two years I’ve participated in a panel about motherhood and career at the women’s yeshiva where my husband teaches. And both years I have sat next to Edna, a religious mother of 5 children, AND the former CEO of a large company with hundreds of workers. Today Edna is a highly successful business woman, and she looks it. So I was pretty surprised when Edna lamented the fact that between her full-time job, her children, and doing all of the cooking and cleaning, she doesn’t have a moment to herself. It turns out that Edna doesn’t have a cleaning lady or any help whatsoever in the house. If there’s anybody who needs and can comfortably afford a cleaning lady etc. it’s Edna. So why doesn’t she? Good question. But don’t most of us do this? I agree that motherhood and managing a home is hard work. But most of us insist on making it harder than it needs to be. We are pregnant and exhausted, but instead of getting help in the afternoons with the kids, we suffer. We are stretched to our limits with 3 children under the age of 4, but instead of buying a kugel we make one, and suffer. We were up with a nursing baby in the middle of the night, but instead of resting while a cleaning lady cleans, we scrub our own toilets, and suffer. Why don’t we take better care of ourselves? Why don’t we think that we deserve at least the same loving care and consideration as the family members we nurture with so much self-sacrifice? Why do we abuse ourselves and ignore our needs to such an extent that we can’t help but secretly look longingly at the plate above and miss, G-d forbid, the good old days? And what’s worse, when we DO do something to make our lives easier, what do we do? 1. Once a week, my house was not my own. 2. Not wanting to have her waste time picking up clutter only to have it back on the floor the minute she left. 3. Cost, which was significant, plus bituach leumi. 4. Needing to entertain her. Not all require this but many did. 5. This is probably just me, but the amount of water and detergent that they used irritated me. I preferred to keep low housekeeping standards instead. Hannah my experience is different than yours. I have pretty severe arthritis in my hands and having our cleaning lady is invaluable to me. Linda does a mediocre job – but she is loyal and willing to do extra when I am having a flare up. She has come for years – she attended our son’s recent bar mitzvah and this year, brought small Hannukah presents for our kids. She is chatty, but I probably set that up because I am chatty :). I started doing desk work on the day she is here so I can get something done. i totally agree that we all have to take care of ourselves, whether we are SAHM’s or CEO’s. it took me 10 kids and turning 50 to finally get off my couch and start seriously exercising and maintaining a healthy diet…. it’s the best gift we can give to ourselves and our families. Great point, Chana Jenny! Thank you. Because we can’t afford help or buying a kugel. We don’t suffer, we do things for ourself and feel good about them afterwards. We have to remember. The happier we are, the more relaxed we are, the healthier we are, the more we are happier and are THERE for our families. Let’s not wait until they grow up (and we grow up) to figure that out. It’s not just preventative for us so that we don’t long those good old days, it will also help us function in the day to day. Too true – love this post. It’s so important that we don’t forget to give to ourselves, nourish ourselves, enable ourselves to feel whole. If we aren’t complete then don’t have anything to give our loved ones in the first place! Amen to that, so true! Even our employers and business counterparts like us better when we take care of ourselves and are not exhausted! Driving oneself tired often leads to bitterness and unpleasantness and it is often the result of setting unrealistic goals. Delegating work is a great art! Thanks for this post – I recently started having a cleaning lady every other week, and I feel guilty! I didn’t grow up with one, and it makes me feel spoiled. On the other hand, with two babies at home, plus working, albeit part-time, I just don’t have the time or energy to do the heavy-duty cleaning myself. Now I feel a bit better 🙂 Although I would also be interested in reading your alternate “heavy-handed” post. Chana Jenny, this is so, so timely for me. I am running myself ragged, I admit it. I cook everything from scratch for financial and health reasons, I work 7 hours a day, I like a clean house, I make one-on-one time for the kids, and I don’t have a cleaning lady. This post made me cry. I would LOVE a cleaning lady, but I can’t afford it. And then I stay up late cleaning, and the result is a cranky Mommy. I do have a dilemma. I’m not sure what to do. Messy house, and rested Mommy? But a crazy messy house is not good for the kids, and not good for me, either. Clean house, cranky witchy Mommy? That’s no good, either. This is my struggle right now, and I really don’t know what the answer is. Cut my work hours? Can’t do that, either. Ask my husband for help? He works all day, also. This has been going round and round in circles in my head all week, and now to read your post and question, why don’t I get a cleaning lady, why don’t I take better care of myself? Well, what do I do if I just, can’t? I found Sharon in the park!! She was bored and I was busy with 5 children under six. I could not afford a cleaning lady either, not really and I told her. She accepted less money if I would knit a sweater for her and take her along shopping because she did not drive yeah! double bonus for me) she has been with us now for over thirty years. We need not to be apprehensive for fear of being too poor for such and such…..just look at your needs and persue a strategy to get relief. I pray a lot and that gives me strength to realize that every one of my needs will be aleviated if I just ask. Dear Rachael Leah, I am sorry, my intention in writing this article was to reduce the stress and pressure we mothers feel, and I feel badly that instead of doing that I have made you feel worse! With that said, I do have two ideas for you. One is to talk your situation over with your husband, and get him on board. And then figure out what areas of the house to focus on, so that you don’t feel that you have to keep the entire house so neat, and reduce your standards overall for the next six months. My second idea is to daven for a solution. Tell Hashem how overwhelmed and stuck you feel in the present situation, and how you see now way out of it, and I believe that Hashem will send you a way to make your life easier. I have done this several times at very stuck, overwhelmed moments of my life, and b”H solutions came flying in from unexpected locations. Chana Jenny, don’t worry, you didn’t add to my stress! I had already been stressing over this, and it felt good when I came to your blog and saw my stress was valid, since it IS valid for me to want – and need! – a cleaning lady. So, although I wrote that your post made me cry, what I meant was cry because I read in your words that it’s really true that I need help, and true that I deserve help, but, my own worries were, I do not know how to get it. You’re right, I definitely need to lower my standards. It was good to read that, and I will try very hard to let go of my perfectionism! Not easy for me when it comes to cleaning, but glad to hear the validation. As for my husband, Rishe, please watch how you say things that you don’t know about. My husband is not getting any “free pass” here. He works 10 hours a day – count ’em, TEN – and he helps with the kids and cleaning with whatever limited time he has left after eating, sleeping, and davening. We BOTH work at night. He’s concerned about my “frazzledness” also, and came to me wanting to discuss ideas of changes we can implement to make things easier for me. We have started some different ideas, and it is helping. Chana Jenny, it’s funny, I have been davening to Hashem for so many different things, but I have not thought to tell Him how much I need help with taking care of my own needs. I do a lot of davening asking for help with all the household responsibilities, but I guess that’s only part of the story when my own needs are neglected. I really overlooked it, thank you for reminding me! Fortunately, I never feel irritated nor guilty about domestic help, I love her. What would I do without her, what would she do without me? For me it is just another opportunity to reach out AND get my freedom to persue other venues of motherhood that interest me more and that I am better at. For my friend Sharon we are extended family and also a source for financial stability. A wonderful match as far as I am conserned. There is only one worry I have, she is so perfect in everything she does, that I live in fear that someone might steal her away from us! I learned this the hard way, when you overextend yourself, you end up crashing big time. My personal solution was to get extra help even though I can’t afford it, and it’s still not enough (my house is not the way I like it), but working outside the house has been the tipping point for me. My husband used to be much more hands on help before his schedule at work became more hectic. A solution for you may be to tap into the chessed programs at school, where girls come to help out because they have to fill hours. What you give them to do can be what makes you feel the least like accepting handouts: folding laundry, holding a kvetchy baby, doing homework with those that need it, or cleaning the kitchen while you take your kids out. Good luck! Very well said and SO on target. I sometimes envy my older single sister — she has the freedom to go to all these interesting events, go away to the beach for a long weekend, go shopping whenever she wants…And when I start getting too envious, I know that it’s time for me to take a trip into the city and sit at Starbucks and have some alone time just taking care of me! Like Hannah, I think many women don’t want extra help in the house because its an invasion of space and privacy. I would imagine there is also sometimes a sense of inadequacy if you end up feeling your home wasn’t cleaned well and you were not able to guide well enough in how you feel it should have been done better. Personally although appreciative of the help, I hate when other people move my things or throw things out that shouldn’t get thrown out. Or put things away where you can never find them because you have a totally different approach to organization. Then there is the guilt that someone is helping you and you resent their moving your things! There is also the financial aspect and the perceived financial aspect. Can the family really afford the extra expense? Wouldn’t the money better be used for (chug for a child, fixing whatever is broken, b/c there always is something etc.) I think women tend to feel that it can’t, even if it can. Maybe we should be asking ourselves whether we are teaching our children how to participate in our households enough. I always think of the Gilbreth’s (cheaper by the dozen) and how every family member was responsible for something in making the home function well. you hit the nail on the head when you mentioned the kids. They love and need to feel important. Even 2 and three year olds can pick things up, like to sort and organize as long as we take the time to show them how. As kids grow up they should be involved in chores and helping. teaching them how to do things rather than criticize is how we build connections and self esteem. Chana Jenny, I really like your advice to Rachael. The husband is getting a free pass but only because she is handing him one. He can’t clean at night because he works all day? As a mother who is actually single again, I got curious when I got your email with that title. But I can tell you that it is none of the fun that you might imagine. I’m sure that if you had thought that through to it’s logical conclusion, you would realize that. Single working moms need cleaning ladies more than anyone, and have a harder time affording them. Any freedom that we had before getting married and having kids is long gone. oy shalvi, that’s heavy news. I didn’t know. Thanks for your comment. I guess my intention was clear in my head but not in the post– I meant someone dreaming about the good old single days, pre-children and pre-husband. Not dreaming of being a single mother, when, as you said, there are way more responsibilities upon you. May Hashem send you and your family a ton of bracha. When we are doing well financially, I allow myself to be ” high maintenance”: cleaning and ironing help, babysitting, and my favorite pricey skin care products! When things are tight, those are the first things to go, and my husband pitches in more, which apart from helping me tremendously, does wonders for wrinkle prevention… Because I get help when things are good, it saves me from being resentful when things are difficult. I read something very nice. It said, when we are overwhelmed, don’t say ” I can’t handle this”, rather: “how can I handle this”…. I like that, thanks yehudit! hmm… well, seeing as how i was single for my entire adult life until i recently got married, i can relate to this post. the single life had many great points – go where u want, when u want, and not have to answer to anyone else. however, i worked at a very labor-intensive job and it was also a cut in pay after i lost my office job. my health was also in bad shape as i was severely anemic and could barely function. there wasn’t enough money to buy food for shabbat and if i did have the opportunity, i didn’t have the energy. so, not only couldn’t i cook for myself, i couldn’t clean, either. there was no one to pick up the slack, i.e., take out the garbage, wash the floor, shop for food, etc. it was difficult for me, but i finally had to accept that if i wanted to eat for shabbat, i had to go out. and the times when i couldn’t find a place, i had to spend extra money, which i didn’t have, and buy food (usually something that was already prepared because i didn’t have the energy to cook). if a person isn’t healthy, life’s not so easy. it’s a little easier if u are healthy. but i have to say that now, things are a bit easier as i have someone to help me (and he does help!). we haven’t been yet been blessed with children, but i know that when we are, it’ll be ok.
the single life can be “glamorous”, but not always. do i miss it? yeah, sometimes. but i’m happy with where i’m at now. I took the cleaning help and some how (thank you Hashem) managed and have been doing so for the past 8 years. It’s just as important to me as food and sleep and sometimes maybe even more. If you only knew how painful it is for divorced individuals in the frum community, you would have taken this post in an entirely different direction. Do you have any idea how poorly single moms and children are treated? Not invited to class birthday parties, asked if they’re really Jewish, told that children of divorced homes grow up to become mentally retarded, the prejudice is staggering… Cleaning help? Most single moms really can’t afford cleaning help…and my secular friends and their children are not treated this way. Single Again party? If there is any way to bring more simcha to the lives of religious divorced women, I say, bring it on and G-d bless! Dear Dana, thanks for your comment. I am aware of the suffering of single mothers, and I certainly did not intend to say that women wish they were single mothers. What I meant was that women wish they were single again without children– which is why I said that they long for “the good old days.” The truth is that I wrote this article in a huge rush, which I think is why it didn’t come across so clearly. I apologize if this lack of clarity caused you or any single mothers distress. Thank you so much – your comment is so gracious. By the way, I heard about this blogpost in a fb group for divorced frum individuals. I’m going to share your comment, it will definitely soothe.